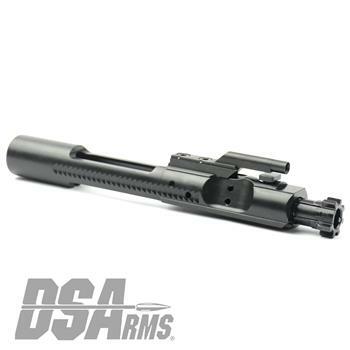 The DS Arms AR15 M16 Cut complete Mil-Spec bolt carrier group is perfect for your next build. We machine these assemblies using the latest manufacturing techniques, material and finishes. The carrier is shot peened 8620 Steel and the bolt is MPI 9310 material. The bolt, carrier & cam pin feature a durable Nitirde Finish for greater resistance to wear, corrosion & rust. This complete AR15 M16 cut bolt carrier group assembly includes the complete bolt, complete carrier with properly staked gas key, cam pin, firing pin and firing pin retaining pin.